There’s no amber alert for chimpanzees, but maybe there should be. Tommy, the chimp who was at the center of a much publicized lawsuit over his rights and “personhood” last year, is missing. Tommy is featured in an Oscar worthy documentary opening today in New York called “Unlocking the Cage” by Oscar nominee Chris Hegedus and lifetime Oscar winner DA Pennebaker. Last night the film was screened at HBO (which will air it once “ULC” has a theatrical run across the country over the next few months) for a bevy of impressive filmmakers including Joel Coen, Nancy Biurski (“The Loving Story”) and Oscar and Emmy winner Karen Goodman. Florida based attorney Steven Wise, who teaches at Harvard Law School, has devoted himself now to animal rights. With his Nonhuman Rights Project, Wise has become internationally known as an animal rights advocate. 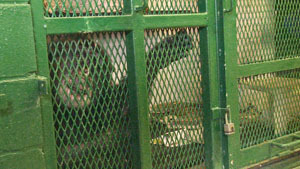 He sued in 2013 to have Tommy moved from a horrible cage in upstate Gloversville, New York to the beautiful Save the Chimps sanctuary in Ft. Pierce, Florida. Wise got the case all the way up to State Supreme Court in New York. In the interim, Tommy was moved from his Gloversville cage to a roadside zoo in the Upper Peninsula of Michigan. Tragically, reports now are that Tommy has disappeared altogether. So far, there’s been no report of his death– which must be reported. Wise and his staff are now on a furious mission to find Tommy. “Unlocking the Cage” traces Wise’s transformation from a lawyer with a large full time human practice to an advocate determined to secure “personhood” rights for all animals. He is not a animal fanatic– he just has a cute dog. But he is insistent that- so to speak– every dog have its day. Like all Pennebaker Hegedus Films, access here is mesmerizing as the filmmakers managed to get into places like courtrooms where cameras are never allowed. You get to see surprising and disappointing examples of how an appeals court is run by justices who you hope you’ll never have to depend on for human rights. And where is Tommy? The hunt is on. Believe me, once you see the chimps featured in this film you’ll want them all moved to Save the Chimps by federal decree. Red Nose Day Charity Last Year Paid Over $1M to Consultants Sued Previously for "Gross Failure"